A solution is a homogenous mixture, composed of solvent(s) and solute(s). A solvent is any substance which allows other substances to dissolve in it. Therefore, it is usually present in the greater amount. Solutes are substances present in a solution. Note that when a solute dissolves in a solvent, no chemical bonds form between the solvent and solute. Solutions have variable composition, unlike pure compounds whose composition is fixed. For example, a 500 mL solution of lemonade can consist of 70% water, 20% lemon juice, and 10% sugar. There can also be a 500 mL solution of lemonade consisting of 60% water, 25% lemon juice, and 15% sugar. The most common type of solution is an aqueous solution, which is a solution where water is the solvent. Aqueous solutions are quite important. For example, acids and bases exist typically as aqueous solutions. When two liquids can be readily combined in any proportions, they are said to be miscible. An example would be alcohol and water. Either of the two can totally dissolve each other in any proportion. Two liquids are defined as immiscible if they will not form a solution, such as oil and water. Solid solutes in a metallic solvent are known as alloys. Gold is an example of an alloy. It is too soft in its pure form, so other metals are dissolved in it. Jewelers may use 14-karat gold, which contains two-thirds gold and one-third other metals. Surface area More surface area gives more opportunity for solute-solvent contact Powdered sugar will dissolve in water faster than rock candy. Temperature Solids are more soluble in hot solvents, gases are more soluble in cold solvents Sugar dissolves more readily in hot water, but CO2 dissolves better in cold soda than warm soda. Polarity Non-polar compounds dissolve in non-polar solvents, and polar compounds dissolve in polar solvents. If one liquid is polar, and the other isn't, they are immiscible. Alcohol and water are both polar, and they are miscible. Oil is non-polar and is immiscible in water. Pressure Gases dissolve better under higher pressure, due to greater forces pushing the gas molecules into the solvent. Leaving the cap off a soda bottle will let the carbonation out. Agitation If a solution is agitated by stirring or shaking, there is an increase in kinetic motion and contact of particles. Therefore, the rate of solubility increases. Everyone knows to stir their coffee after adding sugar. In general, the rate of solubility is dependent on the intermolecular forces between substances. The maxim "like dissolves like" will help you remember that substances must both be polar or non-polar to dissolve. A sodium ion in solvation with water. The forces between the particles in the solid must be broken. This is an endothermic process called dissociation. Some of the intermolecular forces between the particles in the liquid must also be broken. This is endothermic. The particles of the solid and the particles in a liquid become attracted. This is an exothermic process called solvation. When sodium chloride is added to water, it will dissolve. 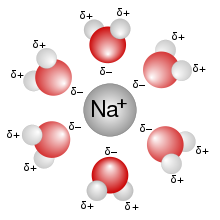 Water molecules are polar, and sodium chloride is ionic (which is very polar). The positive ends of the water molecules (the hydrogens) will be attracted to the negative chloride ions, and the negative ends of the water molecules (the oxygens) will be attracted to the positive sodium ions. The attractions are strong enough to separate sodium from chloride, so the solute dissociates, or breaks apart. The solute is then spread throughout the solvent. The polar water molecules prevent the ions from reattaching to each other, so the salt stays in solution. When a solution can hold no more solute, it is said to be saturated. This occurs when there is an equilibrium between the dissolved and undissolved solute. If more solute can be added, the solution is unsaturated. If a solution has more solute than is normally possible, due to the lowering or heightening of temperature, it is said to be supersaturated. If disturbed, the solution will rapidly form solid crystals. Sometimes, compounds form crystals with a specific amount of water in them. For example, copper(II) sulfate is written as CuSO4 • 5H2O. For every mole of copper(II) sulfate, there are five moles of water attached. The atoms are arranged in a crystal lattice. Even if dried, the compound will still be hydrated. It will not feel moist, but there are water molecules within the crystal structure of the solid. Intense heat will release the water from the compound. Its color may change, indicating a chemical change. When the anhydrous compound is dissolved in water, it will become hydrated again. Some chemicals change temperature when dissolved. This is due to a release or absorption of heat. The specific change is known as the heat of solution, measured in kJ/mol. Some substances break up into ions and conduct electricity when dissolved. These are called electrolytes. All ionic compounds are electrolytes. Nonelectrolytes, on the other hand, do not conduct electricity when dissolved. Electrolytes are the reason that tap water conducts electricity. Tap water contains salts and other ions. If you have purified water, you will find that it does not conduct electricity at all. Upon dissolving some salt, it conducts electricity very well. The presence of ions allows electrons to move through the solution, and electricity will be conducted. a) which substance is the solute? b) would these two substances form a solution? 2. Solutions are formed as physical reactions. Using this principle, name two ways in which solutes can be separated from solvents. 3. Three different clear, colourless liquids were gently heated in an evaporating dish. Liquid A left a white residue, liquid B left no residue, and liquid C left water. Identify each liquid solution as a pure substance or a solution. 4. Compare three bottles of soda. Bottle A was stored at room temperature (25°C), bottle B was stored at 10°C, and bottle C was stored at 30°C. a) If you wanted a fizzy drink, which bottle would you choose? b) If you wanted to change the gas pressure of bottle C to that of bottle B, what could you do?